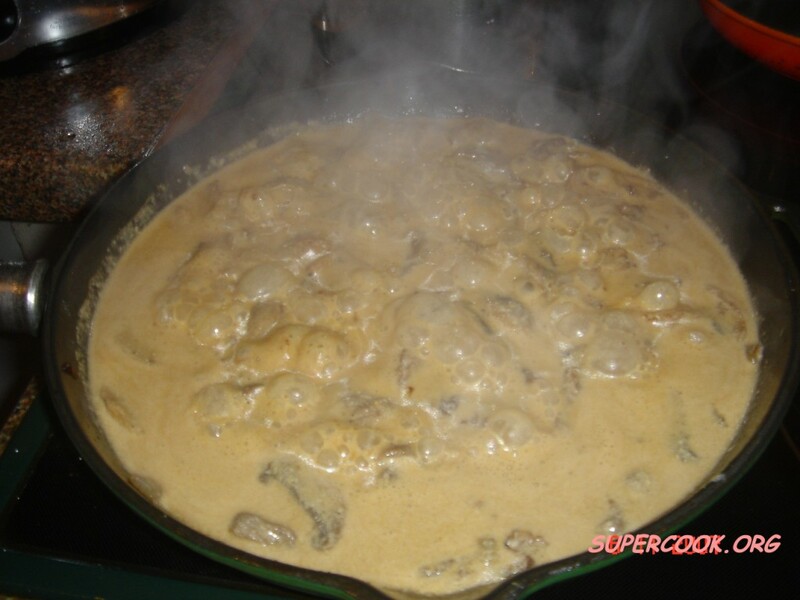 Beef Stroganoff or Beef-Stroganov (in Russian: Бефстроганов Befstróganov) is a Russian dish of sautéed pieces of beef served in a sauce with sour cream. From its origins in 19th-century Russia, it has become popular in much of Iran, Europe, North America, Australia, South Africa, Lebanon and Brazil, with considerable variation in the actual recipe. Elena Molokhovets' classic Russian cookbook (1861) gives the first known recipe for Govjadina po-strogonovski, s gorchitseju "Beef à la Stroganov, with mustard" which involves lightly floured beef cubes (not strips) sautéed, sauced with prepared mustard and bouillon, and finished with a small amount of sour cream: no onions, no mushrooms. A 1912 recipe adds onions and tomato paste and serves it with crisp potato straws, which are considered the traditional side dish in Russia. The version given in the 1938 Larousse Gastronomique includes beef strips, and onions, with either mustard or tomato paste optional. After the fall of Imperial Russia, the recipe was popularly served in the hotels and restaurants of China before the start of the Second World War. Russian and Chinese immigrants, as well as U.S. servicemen stationed in pre-Communist China, brought several variants of the dish to the United States, which may account for its popularity during the 1950s. It came to Hong Kong in the late fifties with Russian restaurants and hotels serving the dish with rice but not sour cream. 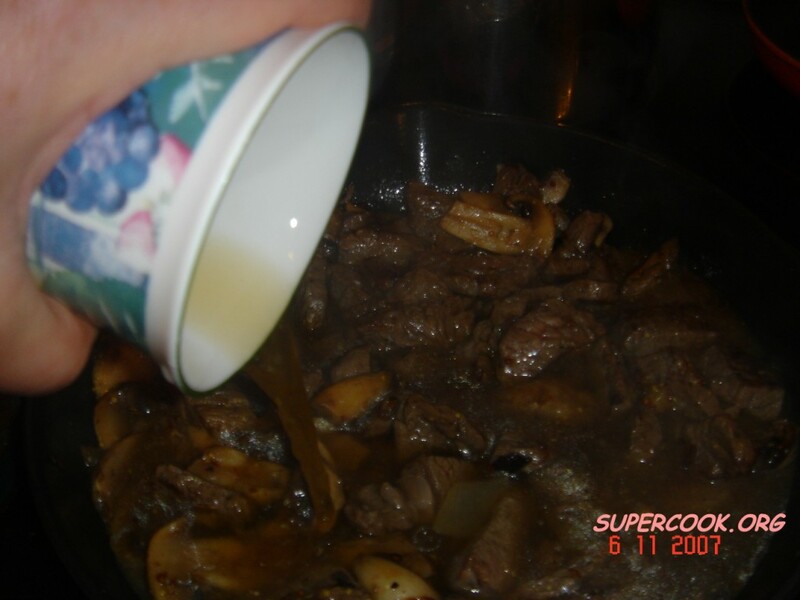 In the version often prepared in the USA today in restaurants and hotels it consists of strips of beef filet with a mushroom, onion, and sour cream sauce and served over rice or noodles. 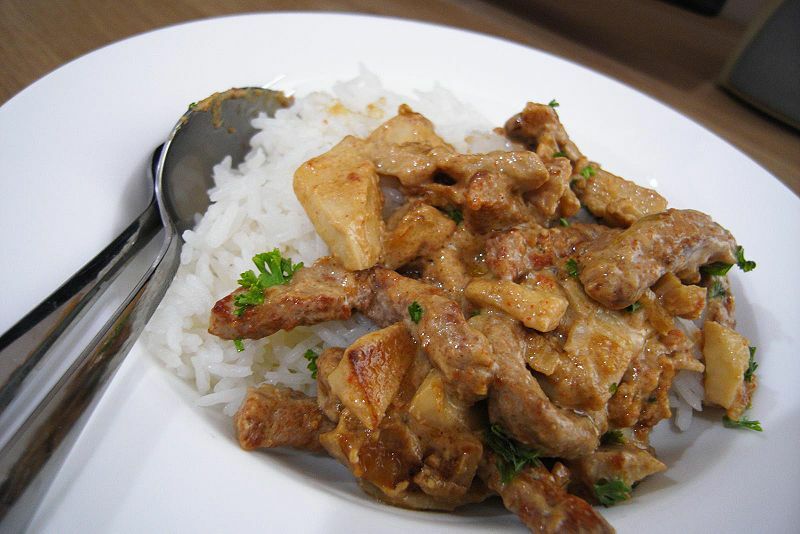 In the UK and Australia a recipe very similar to that commonly found in the USA has become popular, generally served with rice. 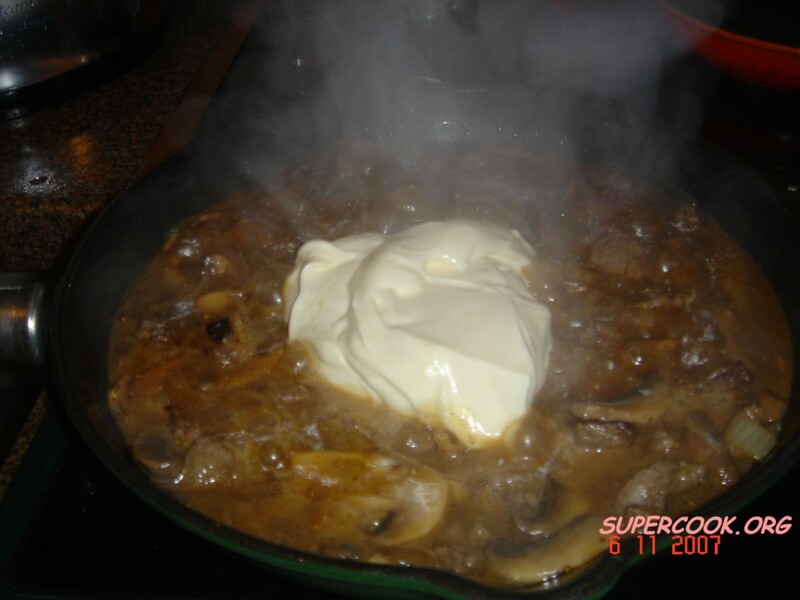 British pubs usually serve the dish to a creamy white wine style recipe, whereas more 'authentic' strogonoffs are often red stews with a scoop of sour cream separately served on top. 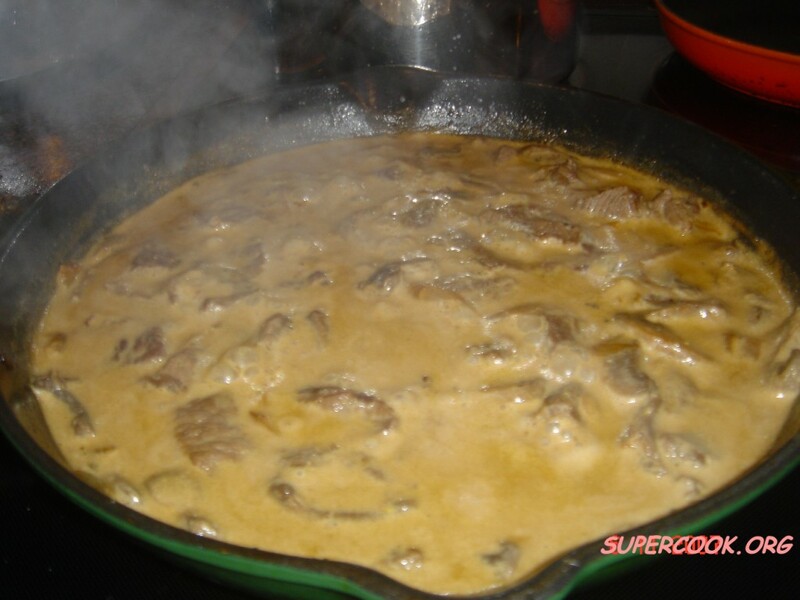 Beef stroganoff is also very popular in Brazil and Portugal, under the name "estrogonofe" or "Strogonoff". 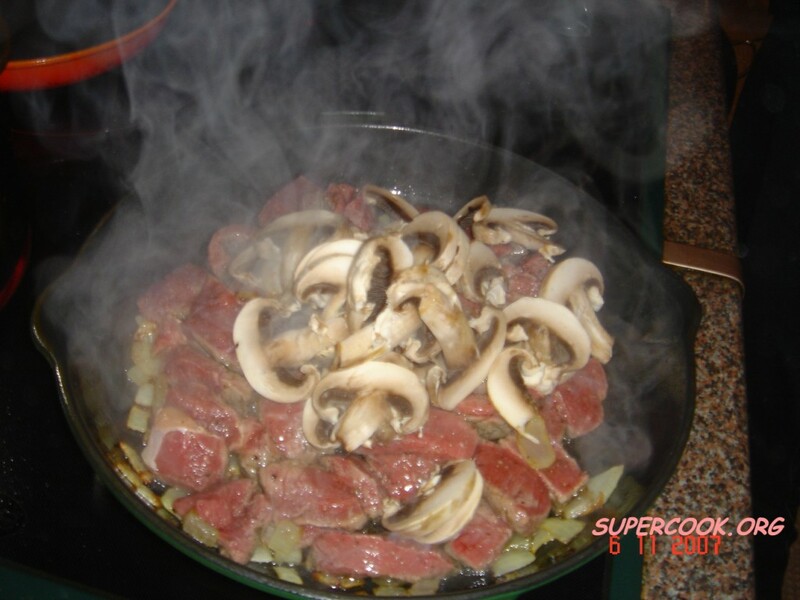 The Brazilian variant includes diced beef or strips of beef (usually filet mignon) with tomato sauce, onions, mushrooms and heavy whipping cream. 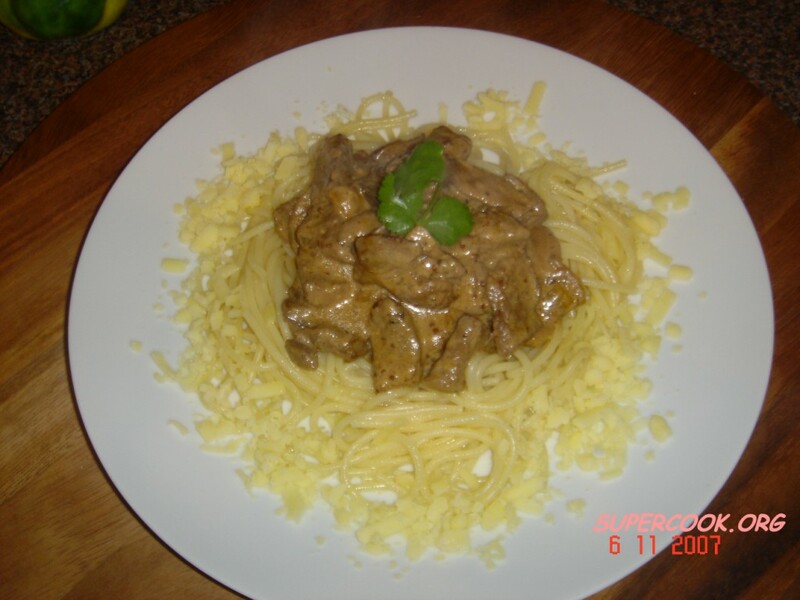 Stroganoff is also often made with strips of chicken breast rather than beef (also called Fricassee in some restaurants in Brazil). It is commonly served with crisp potato straws, as in Russia, but with the addition of white rice. Sometimes one can also see creative servings of estrogonofe, such as a crepe filling, a topping for baked potatoes, or on pizzas. It is so popular among Brazil's urban middle class that there are fast-food chains dedicated to it in the food courts of many Brazilian shopping malls. Many recipes and variations exist: with or without wine, with canned sweet corn, with ketchup instead of tomato sauce, etc. Peel the onion and cut into thin slices. Heat the butter and oil in a large frying pan and cook for 5 min. 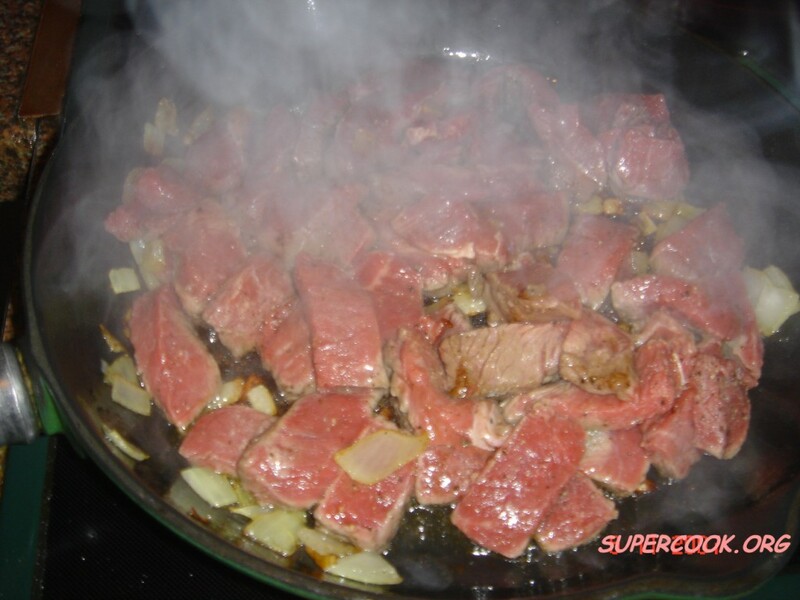 Cut the beef into strips about 5 cm/2 inches long and 2-5 cm/1 inch in width and thickness.